This audio "noise" is very disturbing us, especially for the audio lover. Such disturbances are commonly called electrostatic sounds that enter through the electrical nets. In addition to electrical "noise", noise can also come from a "click" thermostat sound or from a mobile phone charger or from a leaked radio signal, this is commonly called RFI (Radio Frequency Interference). As I wrote above, the "noise" goes through the power cord, and can also pass through the interconnect cable (audio input cable). For these interconnect cables, the easiest way to overcome them is to replace better quality cables. Because good interconnect cables (usually coaxial) are characterized with many protective fibers connected to the ground. The practical solution dispels the audio "noise" on the power cord. The most common way to do this to pair the 'AC-Line Filter' is that you can buy it at the electronics store. 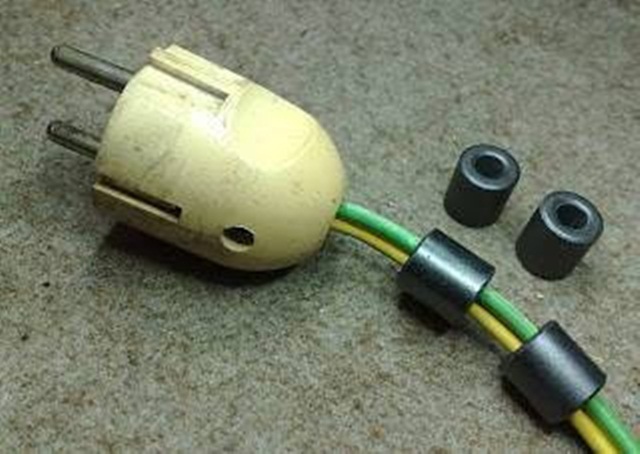 There are other ways more practical, namely by utilizing used "ferrite core". You can use ferrite of flyback tv, ferrite of from MW radio tuner, or ferrite in cylinder form (you can buy it in electro shop). An application using ferrite is by wrapping the power cord at the flyback ferrite tv core or the MW radio tuner ferrite. You are free to wrap the cable in ferrit, with only 5 loops or 10 loops, this is done until the "noise" is not heard again. Because there is no standard rule. Likewise with the installation of ferrite cylinders on the cable. Hopefully the practical way of removing audio "noise" is very useful for you..
And hopefully you are not bothered by this "noise" again..